what would you look/sound/feel like? 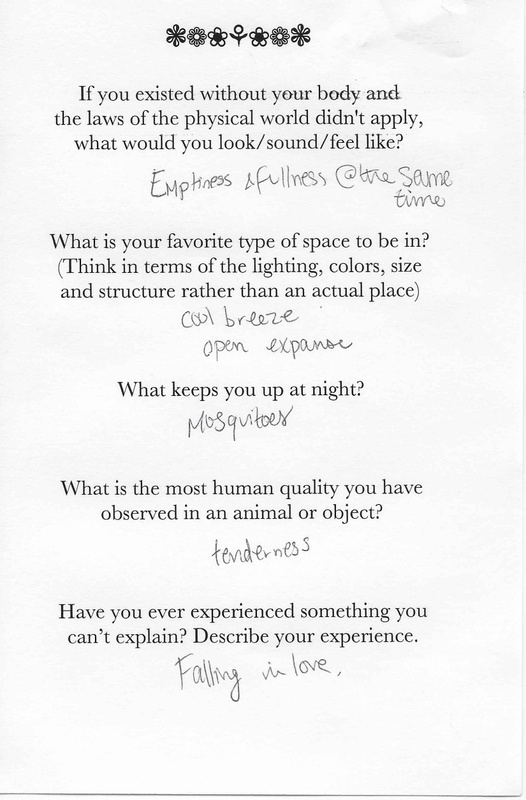 Q: What is your favorite type of space to be in? observed in an animal or object? can’t explain? Describe your experience. A: I would probably look like light, sound and feel like true love. A: Calming. Hues of pastel colors. Can be inside or outside. A: The fear of failure, the excitement of the unknown. A: Body language exists in animals! A: Being attacked by what I think might have been a demon/manifestation of negative energy/ghost? Felt like I was being choked in my sleep. It was a lot. A: I'd feel like pulling warm blankets out of the dryer. A: Gold dim lights with colors all around. A: Like stepping outside on a beautiful spring day only to get hit by a bus because you were too preoccupied. Falling in love. A: Somewhere in nature, watching the sunset. A: Nothing--sleep deprivation kicks in and I instantly fall asleep. A: Like a raging fire. A: The smile of a baby monkey. A: When I fell into the ocean. A: When Travis comes in on Beibs in the Trap. A: Open. Lots of glass. Think Apple store in a forest. A: My dog's eyes when she's begging for food. A: Light, small, green (or outside)! A: The little ball of light from Harry Potter. A: Their ability to love. A: Omniscient. I'd look like a free spirit and sound like the wind. A: My room with only white christmas lights. A: God came to me in a dream. I didn't believe him. He asked if would if he rearranged the stars [sic]. He did but it was a dream. Two different people did this one. Person #1: A giant orange/red orb submerged in water. I would probably feel like a whale. Person #2: Able to breathe underwater and float along. Person #2: Circular space, dome base with an apex roof-- neutral colors and soft pastels with open windows to smell the petrichor... Glass floor to ceiling windows at treetops [sic]. Ocean in the distance. Wood floors. Person #2: Painful realization that we are all meaningless in a dark, abysmal world. Person #1: Breastfeeding and loneliness. Person #1: I think I've been in love but I'm not sure. He occupied my thoughts in the best way but I never felt close enough to him (emotionally) to ever tell him that. Was it love? Was I scared? A: Fuzziness in a tribble. A: Open, detailed/engaging, natural colors. A: Major doubts about myself and my life. A: Animal emotion of understanding in dogs [sic]. A: A bluejay with a better song/voice. A: Gauzey beach tent at noon-- with a breeze. A: The safety/future of my children. A: Tons! "Other" additional dimensions not typically open to our "five senses." A: A room by a fire while it's raining outside. A: Anything when I haven't slept for 48 hours. A: Definitely like a floating leaf. 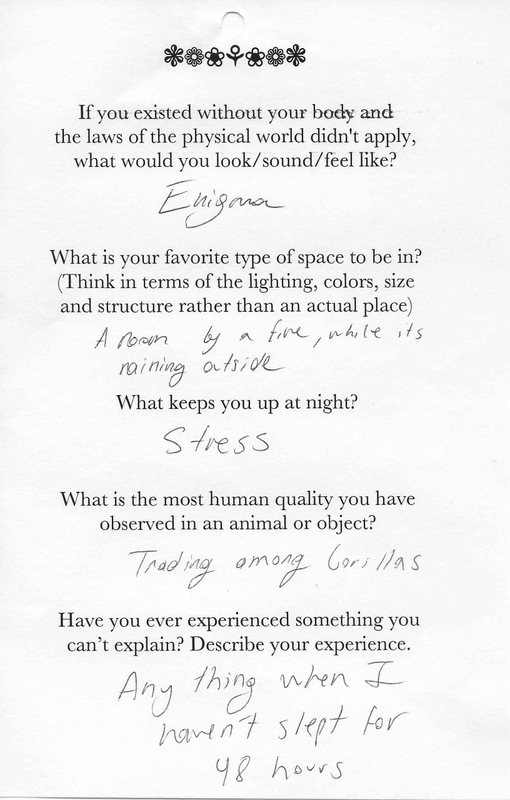 A: I would feel like nothing and sound like something. A: Cold room/good music, wood accents. A: Yes but I can't explain it. A: I'd like to be a mermaid but who know [sic] what I'll be? 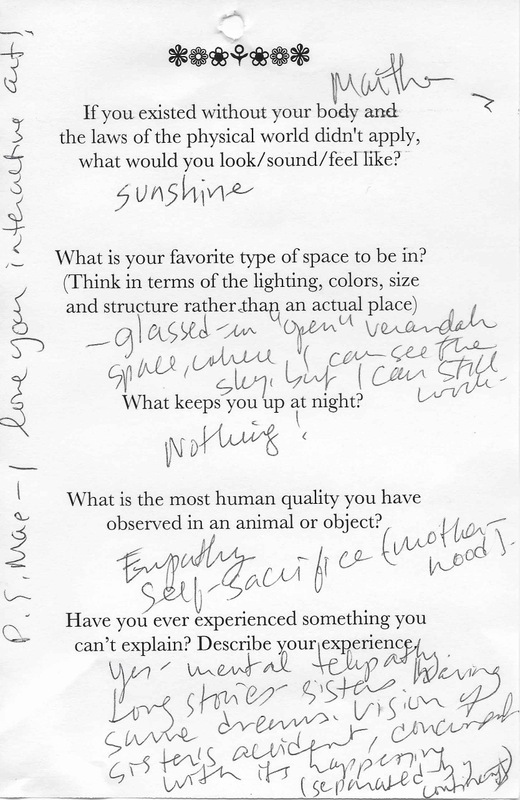 A: I like to be in light, uncluttered, large, nice-smelling spaces with a generally chill ambiance. A: A dense nebula of golden light which pulses, grows and sheds tendrils, changes shape based on emotions experienced and music listened to. A: -Blues (warm and bold). -Music (as eclectic as possible). -Small, but cozy, not cramped. -Dimly lit (naturally, as in dawn or dusk). A: Both the painful thoughts of my traumatic childhood and the hopeful thoughts of what I'll accomplish with my life and all the people I'll help. A: Books; They're able to transmit ideas and stories across time and space, and each has a distinctive voice, personality, and story to tell. (Kind of a cop out since they're created by people in an intimate process, but whatever). A: Literally not enough paper to try to describe, but I woke up, felt a presence in the room, couldn't move my body an inch, super scary morning. A: A warm fuzzy feeling. A: I would feel like taking your bra off at the end of a LONG day. A: Golden hour submerged in water. A: Worrying about everything. Worrying about someone. A: Dying from a broken heart. A: How I feel when I wake up when the sun is rising. A: Like pure language with emotion swirling around it. A: On a raised platform or deck, about 20 feet square [sic], in view of the ocean, breezy. A: Yes, an object that was placed in one spot and appeared in another 2 minutes later. A: --Glassed-in "open" verandah space, where I can see the sun, but I can still work. A: Yes-- mental telepathy. Long stories-- sisters having the same dreams. Visions of sister's accident, concurred [unsure if this is the word they meant, it was difficult to read their handwriting] with its happening (separated by continent). Written on the side of the page: P.S. Mae-- I love your interactive art! 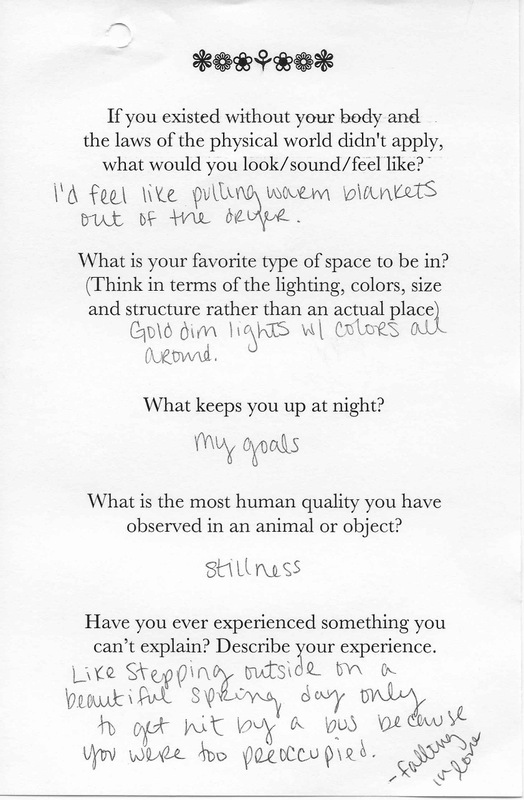 A: I would float around like an astronaut. A: Dappled shade, slight breeze, sound of wave [sic] and birds. A: My husband's recent layoff. A: The scent of my deceased dad's aftershave in my car. He had never been in that car. A: I'd be a tritone, duh. A: [Something is crossed out] Anger.